I made some cards with the Home Sweet Some collection to share with you today and I lost them!!! I'm in the process of moving and have other people helping me and someone packed my scrappy goodness! So I was frantically going through boxes trying to find them and I finally did!! I have to say I'm not a huge card maker, so most of mine are pretty simple, but I still think they're pretty. I actually made them for people that have been helping me fix up my new house and helping me move in. That made it much easier for me to make them too. I made all three of these using one sheet of paper and some of the embellishments that go along with the Home Sweet Home collection, with a few heart hugs added in. I started with this card, I loved the teal color so I chose that as my background. It actually said Friends are our chosen family, but I covered that up with the opposite side of the patterned paper. 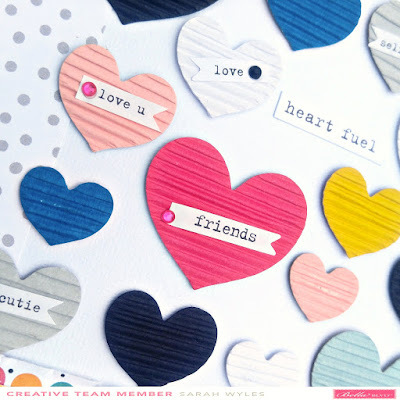 I grabbed both the ephemera words and the ephemera icons, pilled out the hearts and layered them on. I ruffled up the edge of the paper the hearts were on, drew some lines to make it look like stitching and then grabbed that AMAZING rainbow washi tape and added some to the top and bottom of the card for some more color and moved on to my next card. I thought the trees on here were already cute, but wanted to add some of the mini heart hugs and the regular heart hugs, so I layered two of the hearts, after peeling the sentiments off, and turned them in to some trees and added some of the enamel dots to the other tree for some more color. Then onto my last card for this week. I layered some of the papers together, I love all of the patterns in this collection so much by the way and I hope you do too!! There so bright and playful so are some many of the other new collection!! After layering the papers I pulled some of the houses out of the ephemera icons and the ciao chip icons, wanting to keep with the house theme and hearts. So I added two of the houses, one was a chipboard piece, a little dimension, and ephemera piece. I found the so thankful piece in the ephemera words and cut the ends to look like pennants, popped it up on some foam adhesive. Layered two hearts behind it, I loved that the yellow heart had a little heart on it too, made it feel like I was adding a third heart. I stuck them down and started to ruffle up the edges like I did on the other cards and added the lines to look like stitching and was done, nothing left to do but add my writing on the inside and send them to the people I made them for! Thanks for stopping by to see what I came up with today. If cards aren't really your thing, try to push yourself and see what you can come up with, even if there something easy like this. There still hand made and the people that receive them will love them and know you took the time to make it just for them! I went into my scrappy room, sat on the floor and pulled a bunch of the Bella collections I have out around me. I chose my first paper, it was the multi colored one from the Oh my stars collection, I used to mat my photo strop on. Once I got that one, I pulled a bunch of papers and embellishments that matched it and went to town adding layers behind my photo and to add some texture I used a punch too. I played with a lot of different papers for my layers and different collections, but I kept switching them out until I finally got a happy bunch of layers. I popped them up on some 3D foam adhesive and put my photos and layers right in the center of my layout. I figured this would give me a center, a focal point. Once I had that down I went in and added some circles I had punched out for another project I had done, I had left overs and they worked great here so I added them in, above and below my photos. I liked the circles, but wanted more there, so I pulled some of the ephemera packs and sticker sheets and started to go threw them. I layered some of the stickers with embellishments and put them in and around the circles, them I popped some of them in with my photo mats and kept going. At one point I thought maybe this was to much, but nope I kept going lol. I pulled out some of the gorgeous puffy hearts and added them in here and there, finished off my title with some of them wonky alphas and decided that I wanted some more purple in my layout. So I grabbed my punch again, cut off about a half an inch and then punched the entire length of my layout and added another purple tone on tone and popped in a few more stickers and tabs and felt done with this layout. I was really happy with the way this turned out and I hope you decided to have some fun with your collections, mix it up a little and play with multiple together too and see what you come up with! Sarah here this morning with a spring themed layout! I really had fun with this layout. I did a lot of fussy cutting with papers from the Island Escape collection. I mean really, how can you not? The flowers are just so pretty!! I started my layout by choosing a bright background and pulling out the Illustrated faith acrylic paints and dry brushing some of the white across the background. I wanted a little separation from all the flowers I knew I was going to add to the layout. I pulled out the beautiful floral paper from the Island escape and started to fussy cut all the pretties. Once I had a the flowers out I started to lay them across the page on a diagonal. Once I had all the flowers lightly placed down, I added a few layers behind my photo and sat it where I wanted and then moved on to working on my title. I knew I was going to have a large title because I had picked it out before I even started my layout, lol. I knew what picture I was using and it was this one of my youngest daughter sitting in our front yard, enjoying the nice warm spring weather last year. I was looking at this photo and looking at my daughter now and how much she had changed, I wanted to make sure I documented the little moments, she has grown so much, the beautiful changes that have happened, so when I found this title, I was like oh yeah this is perfect! After adding my long title, I went back in and wanted to add some more texture to my layout so I popped some of the flowers up and adding some messy thread clusters here and there. 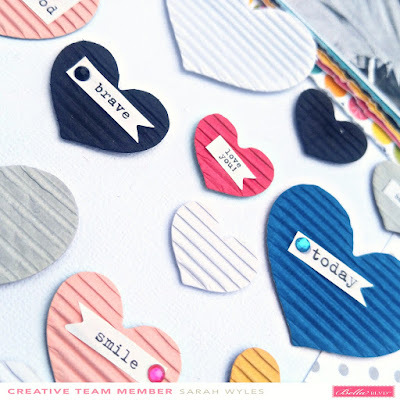 I have a thing for the enamel dots that come along with the heart hugs, so I grabbed some of those in white and added them around my layout as well. I was really, really happy with the way this layout turned out. The bright colors were fantastic and the flowers were great with the spring theme. I didn't want to take the chance of messing my layout up by writing on it so I flipped it over and added some of my journaling to the back of my layout. After I added my journaling on the back I flipped it back over and thought it could use a bit more, so I roughed up the bottom and top and added a little pop of a patterned paper that was in the same pink as in the flowers and tucked a few of those in there too and was done! I hope you enjoyed this layout and that you will visit again to see more spring inspired work from the team! Good morning everyone!! Sarah back this morning to share a simple layout of a few of my littles with you. This week at Bella we are using the Heart Hugs and I love these!! They add dimension, texture and not to mention they are so cute!! I had a small picture of three of my littles cuddling on the couch one day, being sweet and not bugging each other, so I had to get this pic, lol!! I wanted something simple, but to be able to add a lot of color. I chose a few papers from the Plaids and Dotty collection, I cut the grey dot down and placed a 4 inch piece on the side of my white cardstock, so this left me a focal point in the center of my layout. I started with the layers behind my photo. I love layers, but this also helped me when it came to time to put my Heart Hugs down, keeping me to certain colors. I added little bits and pieces from different collection in my layers, Oh my Stars, Alex and Plaids and Dotty. And then I pulled out all the pretty packages of these hearts!! Some of the Heart hugs have words on them and little bitty rhinestones, I love them, but I decided to remove some of the little sayings and words and just add the cute little textured hearts. I didn't add them in any particular order, I just put them down where I thought they looked good. I added a boarder sticker in black and white dots coming from the top and bottom of the layout just for a little more focus and that finished it for me. This month I had the pleasure of working with some of the exclusive products coming to the Joann shelves! Have you guys spotted the latest Illustrated Faith products at your local JoAnn store? JoAnn has worked to create some new and exclusive items from the Advent and CHRISTmas collections. They aren't in every location, but I'd love to know if you have spied some at your local store! I had a little fun with the exclusives in this collection with a bunch of the 12x12 Papers and all the little goodies! I knew they belonged in an exploding box! I plan to fill it with December memories for my little one to flip through and read together! I loved adding all of these interactive features for my little man to pull out, when we are looking through it together! I made sure to make lots of little pockets to slip in some photos and Christmas memories. I also slipped in some little pull-out journaling cards for even more Christmas memories this year! Thank you so much for stopping by today to see another project using the Exclusive Joann Christmas collection. I'm so excited to see what you guys are finding at your local Joann store! I'm excited to share some of the exclusive stamp sets in this collection next, so stay tuned the next couple weeks! These stamp sets are huge and have a ton of stamps on them; some of them even have coordinating dies! I loved working with the exclusive items in my Illustrating Bible! It's been a blast getting acquainted with the new size, and these products were the perfect addition! Thank you so much for stopping by today to check out my Bible journaling page! I'm so excited to see what guys are finding at your local Joann store! Good morning everyone! 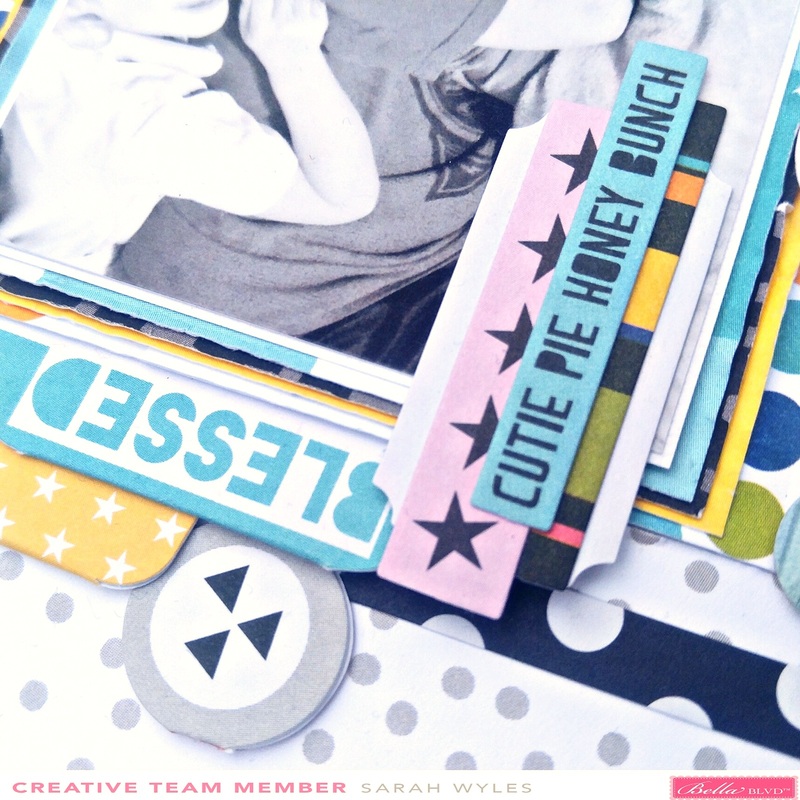 I'm here this morning to share a fun new layout with you of my youngest son and one his favorite things to do! Archery! He loves to use his bow and his BB gun and hes great at it! I chose my background, the black and white crosses and then moved to the bright stripped paper. I cut a strip of that and places it down to have a guide line to where I wanted my photos to go. I matted my photos with white cardstock and started to cut my layers for behind them. I cut the layers in to pennants and decided this was where I wanted to place my title. I knew I wanted to use some more of my acrylic words and the perfect went, well perfectly! lol So I used that, the color was perfect and then I added the rest of my title in with some of the wonky alphas and I thought I looked pretty good, so I moved on to adding embellishments! One of my favorite parts! Since the left side of my layout was where I places my photos and title I thought I would add some cute embellishments to the right side. I used some of the stickers from the sticker sheet and popped them up on some 3D foam, I placed an epoxy circle sticker over the top of a piece of paper I had punched out and layered with one of the die-cut ants, layered a few leaves here and there. Then I decided to add a few hearts in and an arrow and punched a few small circles out and places them where I wanted and was done with this layout. The new collections of Bella Blvd pennants are amazing! They have become one of my absolute favorite Bible journaling goodies; there are no craft supplies that are strangers to my Bible! If I think it's pretty then it will inevitably get smashed in! That's the beauty of Bella Blvd products; they are so darn cute and versatile! Today I wanted to share with you 2 pages I created while I was on a getaway with my fellow Bible journaling gals. We were surrounded by a gorgeous landscape, and it was only fitting that I used the new collections to reflect that on my pages. The Island Escape and Bug Explorer pennants were the perfect addition. These pennants make the perfect bold word in my Bible journaling! I also love the full back of adhesive; it just makes me squeal! What have you guys been using the new pennants for? I pulled out my hot glue gun for the first time in a long time because I knew I would be putting some of the amazing Bella Blvd acrylic words to use on my layout. I also wanted to use these two cute photos of my son playing in a local fountain. We as a small family have made it a habit of teaching my son that when we leave the house, we are going on an adventure. He gets so excited, and it has taught him to cherish even the simplest of activities! I started with the florals in the Make Your Mark collection; I fussy cut a few for my background. After I arranged them where I felt they were visually appealing, I sliced some holes with my xacto knife for some brads. I strung the brads together in a random fashion with white embroidery thread. I really wanted to be able to anchor my acrylic words on the thread. All that was left was to layer away near my photos and add a few embellishments. This layout really came together easily for me, and it has me longing for more everyday summer adventures! Thanks so much for stopping by today to see how I used the beautiful acrylic words on my layout! I hope you all are squeezing adventure into all of your days! Sarah here this morning to share a little wall decor I made thinking of my mom. And on the plus side, I got to dig into the new Mom Life collection! I was so excited to get this collection and I have to say I love all the new collections, they are even more beautiful in person! I had recently been unpacking and organizing another box of my scrappy stash and found a canvas heart frame. It was actually supposed to be used as a little bulletin board, but I thought it would be great for a little home decor. I knew I wanted to break into Mom Life, so I chose a picture and dove into the collection. In the ephemera pack there were already beautiful floral die cuts, but I wanted more. So I pulled out the My Tribe paper and started to fussy cut some of the flowers out. Its so hard to chose just a few to use, I had to remind my self that all of them didnt have to be used on this one project, even though I really wanted to play with them all!! I decided that I wanted my photo backed with some more of the pretty papers, with the canvas background I thought it needed some more color to separate my photo from the background. So I pulled out some more of the My Tribe paper, Daily details and started to cut and add layers. Once I was happy with the layers and the way they looked I popped it up on foam adhesive and added it to the middle of the heart. At this point I wanted to start tucking the ephemera pieces and the fussy cut flowers in the layers and behind my photo. I popped some of them up on foam adhesive, bent a few of them up, but just like a lot of my layouts I worked on a diagonal, I started from the bottom right, worked some of the pieces around the right side of the photo cluster and then moved to the upper left corner. After I tucked the pretty flowers here and there on the diagonal, I went back in to my Bella goodies and pulled some more pieces that work perfectly with this collection. I love the little pom poms and the epoxy stickers, so since they matched I started to add those in too. The little Pom poms added some more texture to my project and then the hexies mini epoxy stickers added some shine popping out around the heart. I did add a few cute clips. Those little bows are so cute and girly and I love to use them, so I pulled them off there clips and added them. I wanted something that would act like a title and I had a bunch of the acrylic words and Smile just stood out to me. We were all so happy in this picture, smiling and enjoying our selves, so Smile was perfect. I added that to the right of the photo and that finished off my wall decor. I had no clue where I was going with this when I started but I am so happy with the way it turned out!